Angola, Congo, Zambia, Tanzania, Kenya, Ethiopia and Djibouti: seven countries, an almost 60 days journey, totalling over 11,000 kilometres amid the spectacular backdrop that is Africa. 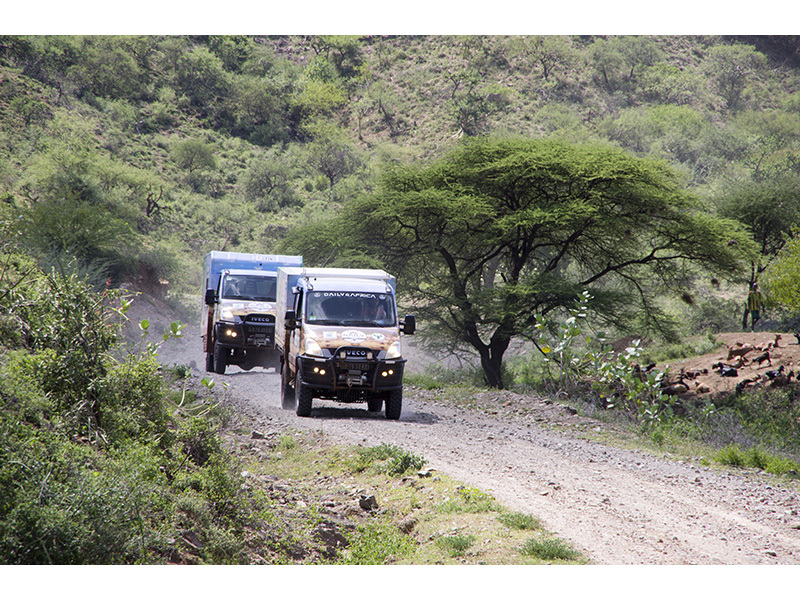 These are the facts that characterise the second edition of the "Daily4Africa" tour, the mission carried out by Iveco and Taurinorum Travel Team on board two, specially-equipped Iveco Daily 4x4vehicles. The objective of this nearly two month journey was to educate and reinforce the concept of road safety with local populations, as well as demonstrating the high performance and reliability of the Daily 4x4, putting them through their paces on African terrain in remote and challenging areas. The Daily4Africa project, a result of the collaboration between Iveco and Taurinorum Team, an agency specialised in large-scale adventure projects for documentary purposes, helps to promote and consolidate the message of safety and correct behaviour on the road, a central theme of Iveco's communication. This has been the subject of numerous international activities over the last year as well as the launch of the collaboration between Iveco, Iveco Bus, New Holland Agriculture and Case Construction Equipment and the International Automobile Federation (FIA) for the FIA Action for Road Safety campaign. Safety is a fundamental value for Iveco: technology applied to advanced safety systems is an essential tool for protecting the driver, other road users, the vehicle and its cargo. The expedition, which started in mid September from Luanda, in Angola, reached Djibouti City, in the Republic of Djibouti, after crossing seven African countries and stopping off at the main Iveco dealers distributed over the territory. During each leg the vehicle was presented to key media outlets, customers and the public, along with organised test drives. The entire expedition was documented both by video and photographically. This media has been published on the dedicated website www.daily4africa.com and on the Taurinorum Team Facebook page (www.facebook.com/TaurinorumTeam), which to date has over 16,000 followers.